I was approaching the “Big 50” and even worse, my weight was almost 18 stone!!! Over the years, you tell yourself, “I will make an effort next year” however, the years pass by and you never do it. We all know what is required, a bit of exercise combined with sensible eating plan, easier said than done. I had been a member of Parklands for over 12 years, mainly using the bar facilities and the occasional swim. I was fully aware of the position I was in and it was not getting any better. It was time to take some action and I started by making a call to Gordon at “Impact Fitness” to arrange a chat to discuss what I could do to help rectify my issues. After our initial chat, I signed up to a 12 week plan with Gordon which required me to attend a 1 hour session with him along with 2 additional hour sessions on my own, following the fitness plan he provided me with. Gordon also gave me advice on what diet would work for me and the best way to stick to it. At our 1st session, I set myself some goals. 1. Get the scales to say 16st something, 16st 13lbs would do!!! 2. Run on the treadmill for 20min. 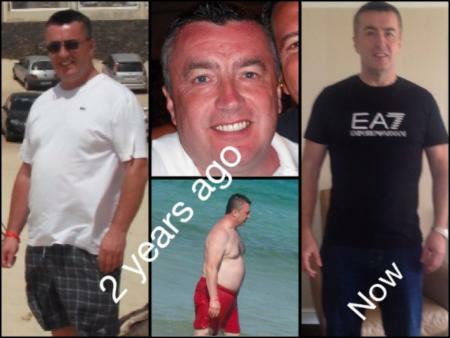 Within a month of working with Gordon, I had lost a stone in weight and my fitness level had greatly improved. My 1st 2 goals had been achieved!!! I completed my initial 12 week programme and had lost over two and a half stone and was running 3 x 5k per week along with various other cardio and weight work. It has now been just over 2 years since my initial meeting with Gordon and I have lost 4 stone in weight and exercise a minimum of 3 times per week. I still see Gordon on a weekly basis and also use Gavin on a regular basis to keep me focused. My body shape, as you can see from my before and after pictures, has changed a lot and I feel like a different person. My wife Lynne has been very supportive in helping me get to where I am and I receive a lot of positive comments from family and friends on what I have achieved. A lot of people are in the same position as I was and I hope my story will provide you with the inspiration you need to do something about it. Finally, I would like to thank Gordon, Gavin and Janice for their support and direction over the past 2 years and also Andrew Barnet at Parklands – superb circuit class on a Wednesday between 7 and 8pm. If I can, you can!! !